Cloud ERP – New Dog, Same Fleas | ERP the Right Way! I am very excited about Cloud ERP and the potential opportunities for customers, however, I like to speak to the minority opinion for a balanced discussion. Just as ERP was deemed the panacea for all business automation pains, Cloud ERP is positioned as a revolutionary approach to deploying an ERP solution. Cloud ERP provides a solution that is flexible, adaptable, scalable, efficient, and affordable. Customers can enjoy painless upgrades, rapid deployment, and easy customization along with availability “anywhere at anytime”! Practically speaking, Cloud ERP is just another deployment option available to customers. The activities required for an “on premise” ERP implementation are also required for Cloud ERP. The scope and responsibility for the implementation activities may be different but most assuredly they are still required. Let’s further discuss the key impacts that a Cloud ERP deployment will have on the implementation. 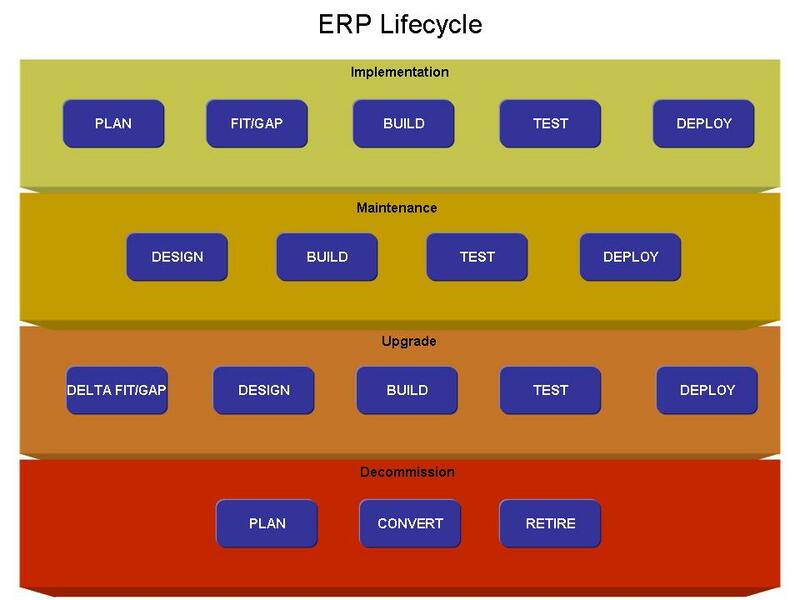 For our discussion, we will refer to the following standard ERP life cycle. A repeated value proposition for Cloud ERP is a quicker implementation and deployment. However, it is important to note that technology has a limited impact on accelerating implementations. The deployment approach for cloud will naturally encourage a fixed, limited implementation scope – however, this is not unique to Cloud ERP. I agree that from a technology perspective Cloud ERP offers a faster installation timeframe. 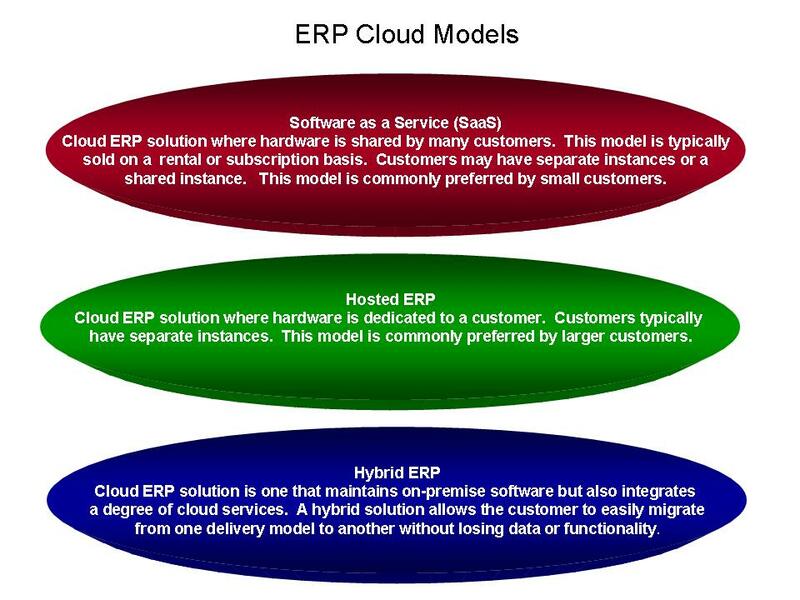 Nevertheless, it is important to note that Cloud ERP is only one component of a business solution. There are still multiple disciples required for a Cloud ERP implementation – especially organizational change management. Cloud ERP can provide very robust functionality but if the organization is not prepared to properly use the software then the value of Cloud ERP will quickly dissipate. Also, note that data conversion and the quality of the data converted will have a significant impact on both the speed and value cloud ERP can provide. Third, integration will be a greater challenge in a Cloud ERP model versus an on-premise ERP model – if only because the Cloud ERP will be outside the company’s internal network. Now, let’s consider the impacts Cloud ERP will have on the maintenance life cycle. There are two areas of consideration for the Cloud ERP deployment model: customizations and integrations. These two areas are impacted based upon the cloud model. Following is a summary of the most common cloud models. The key consideration is whether the customer has a dedicated software instance or a shared software instance. In general, a customer will have greater flexibility with integrations and customizations if the customer has a dedicated instance. If multiple customers are on single software then the Cloud ERP provider may limit the level of integrations and customizations because the software changes may have an adverse impact on all the customers on a shared instance. ERP upgrades are necessary for software maintenance compliance and generating opportunities for greater return on investment. The responsibilities may shift for performing the technical upgrade, however the customer must provide resources for providing input to the delta fit/gap process, conducting organization change, testing, and validation. Another key consideration is if the customer has any flexibility on the frequency and timing of ERP upgrades. Lack of flexibility may result in the customer managing to the Cloud ERP vendor’s timetable. There is a relationship between customer size, integration requirements, customizations and ERP deployment models. As a customer matures and grows there will be a need for greater integration and customizations to address unique competitive requirements. Customers must balance cost and flexibility in selecting the right ERP deployment model. Cloud ERP is providing additional opportunities for customers to leverage ERP as a viable option to support business operations – especially for smaller businesses with limited resources that require out-of-the-box functionality. However, it is important to remember that Cloud ERP is not a short cut to success. Responsibilities may change but the same activities are required to ensure a successful solution. As with every deployment model, there are advantages and disadvantages to consider. It is in the customer’s best interest to consider all phases of the ERP life cycle when selecting the appropriate deployment model. For the past twenty years Brett has helped customers select, implement, and manage ERP solutions across five industries (manufacturing, professional services, staffing, retail, and telecommunications). Business process knowledge and experience includes human resources, benefits, compensation, recruiting, time & attendance, finance, resource scheduling, contract administration, services procurement, sales, billings, project accounting, and project/portfolio management. Software selection experience includes evaluation of both ERP software and proposed implementation services. Brett has recently authored a book on leading ERP/COTS implementation strategies. Great article Brett ! You rightly highlight that the effort associated with an ERP implementation and support is mostly non-technology based: organization change management, training, data migration and so on. You also mention that of the technology-related efforts, several work-streams (such as customizations or integrations) are not reduced by a cloud-based delivery model. However it is important to stress that other technology related work-streams (installation, software patch, some configuration, system monitoring, hardware procurement) are made unnecessary with a cloud-based delivery model. Although this is only a part of the picture, it is the “scariest part” and the principle reason many ERP customers end up with vast consulting bills at the end of the project. Better to remove the most technical tasks and have the ERP software vendor take care of system set-up and operation, and let the customer’s staff and consultants focus on the really important stuff like business process design, education and organization/data readiness. One other point, although cloud-ERP is not the same thing as an out of the box or “preconfigured” solution, it often encourages this. Can be too much mind, some cloud-ERP systems do not even have flexibility to customize, tailor, extend or integrate. But if a software vendor gets the balance right then they can deliver a flexible cloud-base ERP system which is pre-customized for the client’s industry and location (including typical integrations) and which can be extended or further customized by the more adventurous customer. This is what we are attempting to do with iBE (www.iBE-erp.com). Have to agree with Richard here and it should be noted that cloud based ERP softwares aren’t a one sized fits all cure all quite yet. It’s still early days though, and as it matures, I’m guessing we’ll see some interesting developments as the big vendors push to get an edge. Cool post by the way. Brett, to a large extent you are right – ERP implementations are ERP implementations and the Cloud – by itself – does not speed this up. However, the fact is that most leading cloud applications are more current/more modern and have been developed using up to date techniques that allow for a quicker implementation, i.e. more configuration oriented, multi-functional, no infrastructure implementation, easily customized, etc. If an on-premise application was developed this same way, it could also be fast. Where we’d disagree is on your suggestion that cloud applications are harder to integrate and customize. Our experience with 300+ NetSuite and Salesforce implementations, is that even with extensive integration and customization, updates are simple. The advent of the true multi-tenant application made this a requirement. Is the fact that you have no choice on the date of the update really a big issue? Our view on private cloud is that this is a step backwards. Private is the same as on premise it just happens to be at a rented premise. Public cloud that is multi-tenant will save cost, is simpler and is upgradeable. Todd, in your experience, have you implemented any fortune 50 company with hundreds of B-B integration, high customization, and the need to move multi-terabytes of data back into the enterprise nightly? I think Brett is correct here, these larger firms may want to proceed with great caution before moving to ERPaaS (ERP as a Service). I’m excited about SaaS but I have yet to hear a success story from the big boys. While in the long-run on-premise software maintenance might be lower – the flexibility, lack of capital investment and lack of upgrade headaches you get with cloud based business packages wins out. Pingback: Cloud Can Bring Out the Best of ERP « ERP the Right Way! Pingback: Fact or Fiction: Hybrid ERP Deployments « ERP the Right Way! Hello Brett, Its great article. I am studying on cloud ERP customization as a master student. 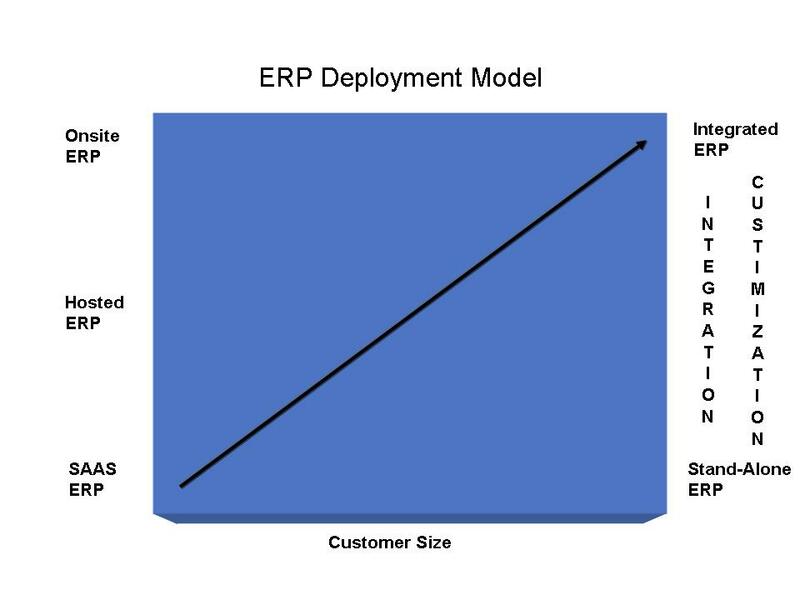 I came to conclusion for cloud ERP models based on data collection as same as yours. But here i’m confused that the cloud ERP models that you talked about is wheather based on your experience or based on some published book or articles? Hope to see your feeback here. Thank you Bickram for your comments. 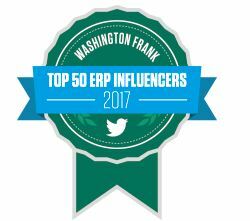 This article is based upon my 20 years of ERP implementation experience and extrapolating that experience to Cloud ERP. Cloud ERP is more about defining a new pricing strategy (subscription) and leveraging an existing deployment model (hosted) rather than utilizing a new disruptive technology. 3. The software is kept up to date, because the cloud ERP vendor has to keep everyone on the same (latest) version. This means that customers generally get the benefit of (or headaches from) new enhancements and improvements. I’m impressed, I must say. Actually not normally do I encounter a blog that’s each educative and entertaining, and let me let you know, you may have got hit the nail on the head. Your idea is superb; the difficulty is some thing that not enough men and women are talking intelligently about. I am quite happy that I stumbled all through this in my seek for a thing relating to this. Pingback: ERP Cloud: Finding the Right Provider « ERP the Right Way! Thanks for your great info about Cloud ERP actually i searching it. I’m impressed your information. Swash Convergence provides ERP Software Solution in the Global market on affordable price.